Submitting and browsing ringing records is quick and easy on BellBoard – you can also confirm performances for print publication in The Ringing World. We hope that you enjoy using BellBoard. 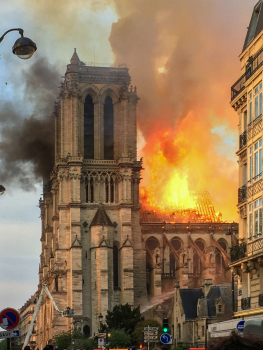 Following the devastating fire at the Notre-Dame cathedral in Paris on Monday afternoon, the Archbishops of Canterbury and York, and Prime Minister Teresa May have asked for bells at churches and cathedrals across the UK to ring out in solidarity when possible this Thursday. 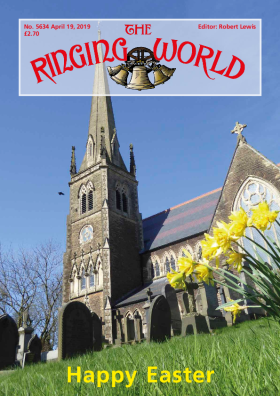 Unfortunately there was a mistake in the email address given for responses at the foot of Revd David Grimwood’s article on page 299 in the 29th March edition of The Ringing World. The correct email is: dwgrimwood@ringingworld.co.uk. There’s now a 25% discount on the remaining stock of Ringing World Diaries and Calendars, including all three versions of the diary. Starting at just £6! Postage and packing is free to the UK and just £1 per item overseas. See pictures and more information here, or to order while stocks last go to shop.ringingworld.co.uk. The Ringing World is very pleased to announce that 24 teams have entered this year’s Ringing World National Youth Contest to be held in Liverpool on Saturday, 6th July. The teams are: Bath and Wells, Bedfordshire Young Ringers, Brumdingers, Bucks and Berks Young Ringers, Cheshire Cats, Coventry Spires, D&N Young Ringers, Derbyshire Young Ringers, Essex Young Eagles, Fen Tigers, Go Bellistic! (SDGR), Kent Young Ringers, Lancashire Lads and Lasses, Leicester Rising Ringers, Lincolnshire Poachers, Oxford Diocesan Guild, Surrey Strikers, Sussex Young Ringers, The G&B, Three Spires, W&P Youths, Worcester Cathedral, Yorkshire Tykes, and Young@Herts. Subscribe to our RSS feed for more news bulletins. Purchase PDF version of issue 5634 (19 Apr 2019). Also available in high resolution. First quarter on the bells. Rung with love for the village and the people of France following the fire at the Cathedral of Notre Dame on 15th April 2019. The band, in order, L-R.
Monday C.D.G. Wirral Branch. — Easter Monday Outing. C.D.G. Wirral Branch. — Conducting Workshop @ Heswall. 25th Jan 2016: If you wish to have a group of quarter peals printed together, for example those rung for a district quarter peal week, please create an event for it, enable Linked performances and then select Collate performances in The Ringing World . Please ensure that all performances get associated with this event before (or at least shortly after) the performance submitter sends them for print so they can be caught and collated. This can be done either by the person who submitted the performance, or by the owner of the event; for performances imported from Campanophile, only the latter is possible. 24th Jan: We now have an RSS feed of news bulletins from the front page of BellBoard. 25th Oct 2015: Users who subscribe to The Ringing World may now see this week's issue in PDF format linked prominently from the front page of BellBoard. If you are a subscriber and do not see it when logged in, this is probably because we were unable to link your BellBoard account to your subscription automatically. Contact us and we will link them manually. We also have a library of back issues allowing users to access any issues from your period of subscription. These currently go back to 2011, but we hope to continue that to 2001; they will remain available indefinitely. 6th Aug: A new page shows the days of the year on which you've rung peals or other performances. 4th Jul: It is now possible to download a PDF version of any performance by clicking on the PDF icon in the updated navigation menu above the performance. Many of the old options on that menu have been relegated to a new edit menu marked with a pencil icon. The left and right arrows (or the arrow keys on the keyboard) navigate to the previous and next performances, and the new up arrow returns you to the list. We would be interested in opinions on this new style of menu, especially regarding their usability on phones and tablets. 2nd Jul: BellBoard now tracks the donations you've made, and allows UK tax payers to fill in a Gift Aid declaration allowing The Ringing World to claim 25p from HMRC for every £1.00 donated. This is all linked from the new-look account page, formerly the user preferences page.